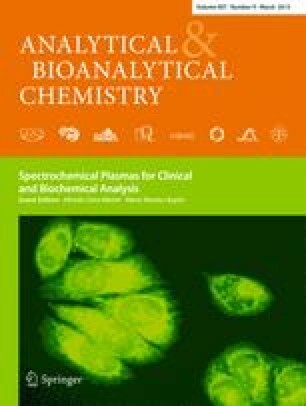 An analytical method using laser ablation-inductively coupled plasma-mass spectrometry (LA-ICP-MS) was developed and applied to assess enrichment of 10B-containing p-boronophenylalanine-fructose (BPA-f) and its pharmacokinetic distribution in human tissues after application for boron neutron capture therapy (BNCT). High spatial resolution (50 μm) and limits of detection in the low parts-per-billion range were achieved using a Nd:YAG laser of 213 nm wavelength. External calibration by means of 10B-enriched standards based on whole blood proved to yield precise quantification results. Using this calibration method, quantification of 10B in cancerous and healthy tissue was carried out. Additionally, the distribution of 11B was investigated, providing 10B enrichment in the investigated tissues. Quantitative imaging of 10B by means of LA-ICP-MS was demonstrated as a new option to characterise the efficacy of boron compounds for BNCT. Published in the topical collection Spectrochemical Plasmas for Clinical and Biochemical Analysis with guest editors Alfredo Sanz-Medel and María Montes Bayón. Olga Reifschneider and Christian L. Schütz contributed equally to this work. Parts of this study were supported by the Cells in Motion Cluster of Excellence (CiM-EXC 1003), Münster, Germany (project FF-2013-17). The contribution of Christian L. Schütz was generously supported by a grant provided by the Boehringer Ingelheim Foundation (Ingelheim, Germany).